Home » Posts » Mid-Week Focus » Cook Up Cupcake, Sandwich and Pizza Poems! Students finish cooking up Cupcake Poems in a Classroom Cafe. Ask your class this: “Who wants a cupcake?” When hands fly, announce that the edible ones are coming later, but that you’ve opened your Classroom Cafe to cook up a lunch full of poetry! You may know the expression, “Life is uncertain; eat dessert first!” Let’s get to dessert…Cupcake poems are on the menu. 1) Distribute cupcake shapes printed on copy paper. Note: Packages of cupcake shapes are available in teacher supply, craft and dollar stores. Glue 4 – 6 cupcake cutouts on a sheet for your master. 2) Choose a theme for the day for the class’ Cupcake poems. Seasonal, food, holiday, and party themes are popular with kids. 3) Instruct students to compose first drafts of their Cupcake poems on notebook paper. You can allow free-verse poetry writing, or challenge students to write rhymes. The poems need to be short to fit inside the Cupcake shapes when students rewrite their finished work in their best handwriting. 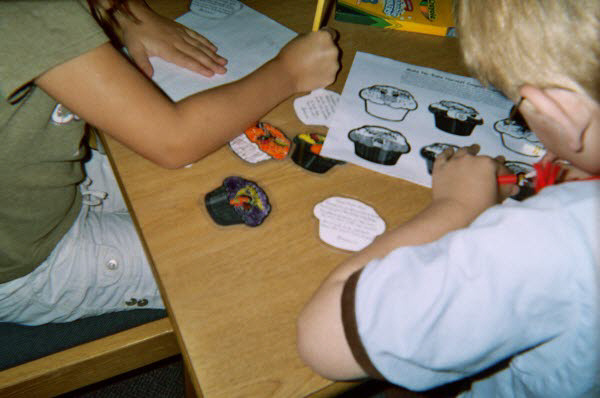 Encourage kids to color around, but not on top of the writing. Answer: When it’s a Cinquain Sandwich poem! Hold the mayo! Turn your classroom into a “deli” – that’s short for “delightful learning space” – that serves up writers’ and readers’ delights on paper…Sandwich poems made with two Haiku poems (top and bottom slices of bread) and a “delicious” Cinquain poem in between (sandwich filling). ♣ Explain to the class that Cinquain Sandwich poems are made as I’ve described above, with one Cinquain poem in between two Haiku poems. ♣ Review how to write Haiku – a poem with only three lines: Following the English language tradition based on Haiku’s ancient Japanese origins, a poet composes the first and third lines of each Haiku with just five syllables. The poet writes the second line with seven syllables. ♣ Remind the class of the first step in writing: choose a focus for their poem. Student poets need to write two Haiku poems to make the “bread slices” of their poem sandwiches. Suggest that they write their first drafts on notebook paper. ♣ Explain that when their sandwich “bread” is ready to fill, students need to write one Cinquain poem in five lines (note that cinco means five in Spanish; cinq means five in French) to place in between the “bread” when they rewrite their finished Sandwich poems. ♣ Instruct kids to choose a focus for the Cinquain poem that connects with their two Haikus. 2) write two words on the second line that DESCRIBE the focus. 3) write three words on the third line that SHOW ACTION connected with the focus. 4) write four words on the fourth line EXPRESSING YOUR FEELINGS for the focus. 5) write only one word on the fifth line that is another word FOR the FOCUS. ♣ Post an example of a Cinquain Sandwich poem on the board as a guide for students. Use the Sandwich poem I’ve written here. Ask if it makes anyone hungry! You can even suggest that kids cook up food-focused poems in your Classroom Cafe. Put Pizza poems on the writing menu in your Classroom Cafe. Students love them! 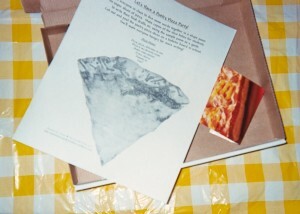 …Follow the basic steps for writing Cupcake poems, but distribute sheets of paper with pizza slice shapes printed on them. Instruct students to write their finished Pizza poems inside the pizza slice shapes. Kids love “cooking up” poetry writing. “Crazy” ways to help students develop core skills, like expressive communication, are effective in gaining and maintaining students’ attention to involve them in a process, like writing. Choose a focus for a poem. Rewrite edited work in a style that fits the format and is attractive and easy to read. Hope you’ll stop back by on Monday for Attentionology for K – 5 Teachers. Please share attentionology.com with colleagues; send comments and subscribe. ‹ Serve Up Sweet, Flowery, Fruity Fragrances to Catch Kids’ Attention! 10 Pings/Trackbacks for "Cook Up Cupcake, Sandwich and Pizza Poems!"